NOTE: This magazine has been permanently modified to 10 round capacity by Calegalmag. Magpul does not manufacture 10/30rd magazines. We specialize in modifying high capacity magazines for restricted states. The modification is done internally with a proprietary limiter inserted into the magazine body and the floor plate is sealed to the magazine body with industrial polymer adhesive. This magazine can not be taken apart without destroying it. 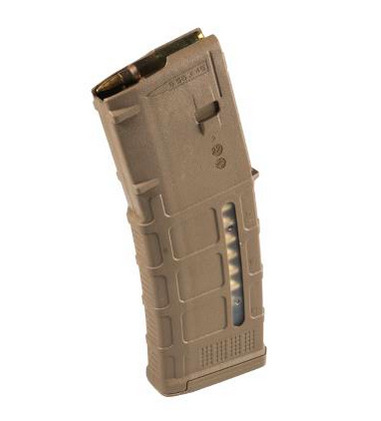 The next-generation PMAG 30 GEN M3 is a 30-round (permanently modified to 10rd capacity by Calegalmags) 5.56x45 NATO (.223 Remington) polymer magazine for AR15/M4 compatible weapons. Along with expanded feature set and compatibility, the GEN M3 incorporates new material technology and manufacturing processes for enhanced strength, durability, and reliability to exceed rigorous military performance specifications. I completed a Colt/Daniel Defense FSP RISII Block II build and purchased these magazines to match Coyote Tan Sopmod Buttstock and KAC Taupe A2 grip and FVG. They match very closely and I like the look. Very happy with purchase and fast shipping! Thanks Calegalmags. Would like to see Colt and Okay 10/30 USGI magazines in your offerings.